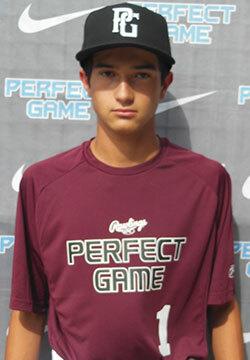 Alex Archuleta is a 2019 SS/ with a 5-8 125 lb. frame from Evansville, IN who attends Evansville North. Compact frame with a lean, athletic build. Projects for additional size with strength. Ran a 7.47 sixty yard dash. Primary shortstop with fluid, athletic footwork while surrounding the baseball. Clean glove actions while funneling the baseball out front and to back hand. Creates good momentum through the baseball while working through transition. Releases from a three-quarters arm slot that produces uphill carry across the infield with accuracy. Solid, athletic actions throughout defensive workout. Right handed hitter with a upright, slightly open stance and high back elbow set. Creates some coil and wrap at load generating torque. Lower half comes through the zone cleanly with linear actions. Matches plane well with a line drive path that created consistent, hard contact to the middle of the field. Flashed the barrel skills to work the baseball to the opposite field as well. Tools will continue to develop with physical maturity.